I decided not to mess around. When I went to work-out at the gym, I grabbed one of my sari skirts to change into after showering. “Yeah, where are you working these days? We miss you here,” said another. It’s true. I’m not working there any more. It’s been all of two days and I already miss it. It’s also true that I put on a skirt to stay cool. 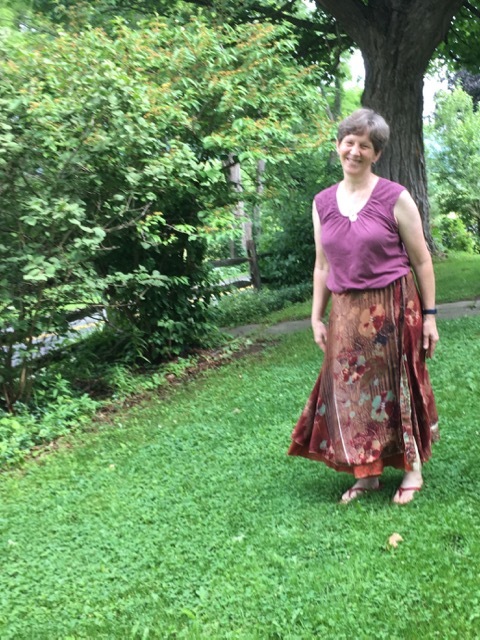 I learned on Sunday how comfortable these skirts can be on a hot hot day in July. I wore the skirt to church and stayed in it all day. Last month I had ordered a number of skirts from a site called Darn Good Yarn. I confess I fell prey to an onslaught of Facebook advertisements. However, a few of my friends had “Like”d the company so I visited. They sell yarn (obviously) but I don’t “do” any yarn crafts. I knit one mitten once. I crocheted about a 4 inch square once. I don’t think either of those qualify. But they also sell these wrap-around skirts made from recycled saris. No two skirts are alike. Each skirt is handmade by our co-ops in India out of recycled saris and turned into the beautiful finished skirt you see. With your help, these artisans are able to sustain year-round employment. I love the idea of repurposing and employing women in another part of the world. Wrap-around skirts are forgiving, especially for people between sizes. If my size goes down (which is what I’m working toward), the skirts will still fit. If my size goes up (ugh), the skirts will still fit. And, if I stay the same, the skirts will still fit. They come in three sizes – regular, x-large, and child – and in varying lengths from mini to maxi. Because every skirt is unique, you tell them the size, the colors you like, and the length. They do the rest. I have not been disappointed. It’s rare that I do product reviews here, but this is something I love. From the artisan to the person who packs our orders, Darn Good Yarn is fueled by infusing Good into all parts of our business. From our warehouse and order fulfillment partnership with Schenectady ARC (a non-profit dedicated to providing employment for adults with developmental disabilities) to our employee benefit programs, our goal is to create a better world by caring and doing things the slightly harder way. In a world of short-cuts and cookie cutter experiences, we believe that when you slow down in order to build that this creates more sustainability and stronger communities. I can get behind a business with those values. 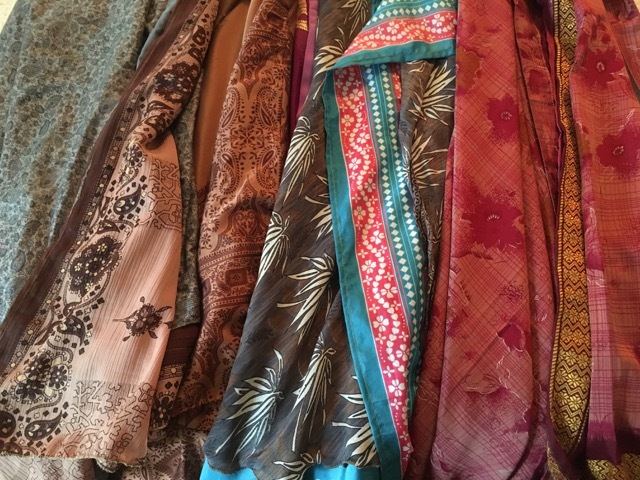 ps — I think they’re running a sale for 4th of July — buy two sari skirts, get three free. I love “Darn Good Yarn” , too for the saris! Comfortable is great for us these days, Sally. Thank you for the steer to this company. I love the ethos and the ethic behind it and I am certain if I visit I will be tempted not just for me but for my daughters too. I am in need of sending them each something. Just because. Because I miss them. Missing is hard right? Be it a something or a someone that we love. So I send you love and strength for getting through the missing of your work. And for the embracing of life at home so your daddy can stay at home. I wish I could send you cool too but here in Massachusetts we’re roasting to well done! Missing is so very hard. We do just-because gifts here, too. They can be the best way to say I Love You. The heat settled in seriously here too.